How can you not explore a neighbourhood with streets called Danger, Liberty, Fraternity, and squares called John Lennon and Revolution? You’ve probably come across articles, or heard friends talk about the cool bars, excellent affordable restaurants, bodegas, chic shops, cinemas, music venues, markets and lovely squares amid a warren of narrow streets in a barrio called Gràcia. Much of what’s written and said is true — Vila de Gràcia is a fascinating area at any time of day or night, every day of the week. You may very well want to put at least one visit to Gràcia on your itinerary. But where is this fabled land? And, how do I get there? Gràcia is about 2.5 kilometres, just over 1½ miles from Plaça Catalunya, and the easiest way to get there is to hail a taxi, but here are six more affordable, and more interesting, ways to get to Gràcia. The public transport times given below will vary depending on the time of year. In August busses, the metro and local FGC trains are not as frequent. However, busses and the metro, and the FGC trains do run on public holidays, including Xmas, unlike the UK, where transport shuts down for the duration. Useful App: If you have a smartphone then you may well want to download the very useful TMB app. The most convenient and quickest route into Gràcia from Plaça Catalunya is to take an FGC (Ferrocariles de la Generalitat de Catalunya) train. ALL 6 lines (L6, L7, S1, S2, S5, S55) leaving Plaça Catalunya stop at Gràcia. Just two stops and you’re there, on Via Augusta. A train leaves Plaça Catalunya approximately every 2minutes during the day between 5am and 6 minutes past midnight, during the week and 2:15am on Friday and Saturday. Time of last train weekdays: 6 minutes past midnight. Time of last train on Friday & Saturday: 02:15am. Time of last train on Sunday: 00:30 (half-past midnight). Use your T-10 ticket exactly as you would on a bus or metro. Line 3 — Green: You won’t find a metro station called Gràcia, but you will find Fontana. Three stops from Plaça de Catalunya and you’ll be on Gran de Gràcia with Carrer Asturies. Or, stay on the metro for one more stop and alight at Lesseps. Journey time: Between 4 and 5 minutes. Line 4 — Yellow: From Urquinaona, get off at Joanic, the fourth stop. This will set you down across the street from Plaça Joanic. Journey time: Approx. 7 minutes. 22 from Passeig de Gràcia and 24 from Plaça Catalunya both stop at several places along Gran de Gràcia. V15 from Passeig de Gràcia will set you down on Via Augusta, near the Gràcia FGC station. V17 from Via Laietana or Roger de Llúria will set you down on Gran de Gràcia. 55 from Plaça de Catalunya at the stop in front of the Banco de España. Bit of a long way round, but you’ll get to see the Arc de Trionf and a few other interesting sights en route. Get off at the top of Passeig de Sant Joan at the junction with Travessera de Gràcia. If you haven’t already experienced Rambla de Catalunya, a much more civilized rambla than the famous Rambles, here’s your opportunity. 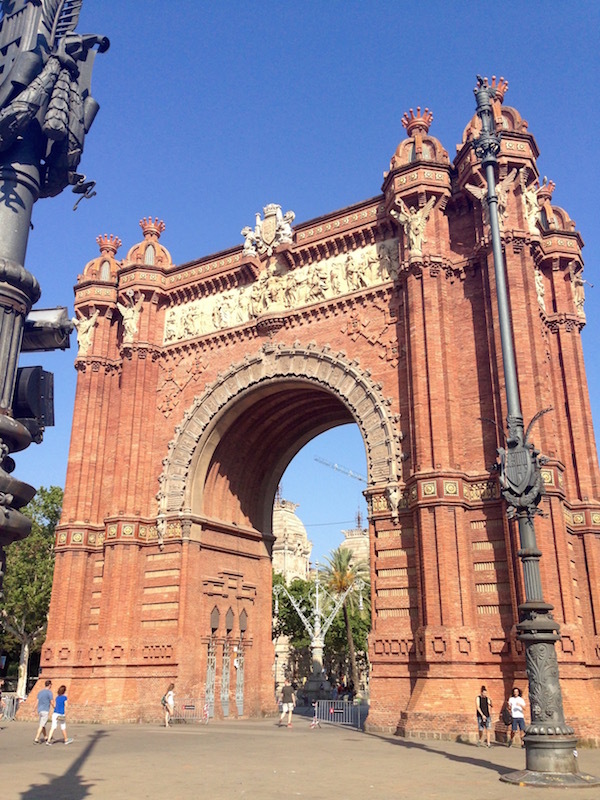 Stroll to the end of the rambla then either cross Diagonal and head up Carrer Minerva, or turn right along Diagonal to Cinc d’Oros and cross the road and join Passeig de Gràcia at Els Jardinets, which then becomes Gran de Gràcia. Head up Passeig de Gràcia, past the two Gaudí houses, (Casa Batlló on your left and La Pedrera on your right) and keep going until you meet Cinc d’Oros, the busy junction with Diagonal, cross the roads and you’ll be in Els Jardinets, and a few seconds later on Gran de Gràcia. You could cycle straight up Passeig de Gràcia or Rambla de Catalunya, but then, when you hit Gran de Gràcia, you’ll run out of cycle way. You could hang a right on Carrer de Bonavista and enter Gràcia that way. 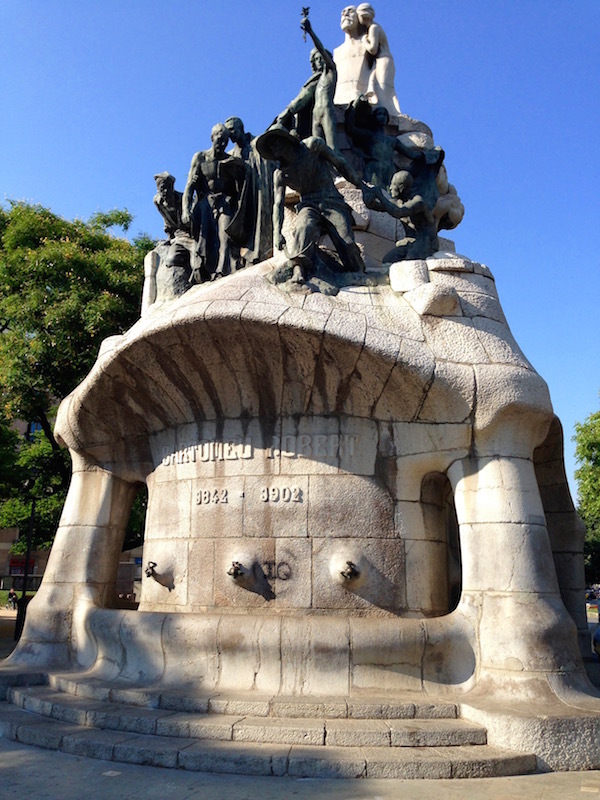 A more pleasant route is to head out along Gran Via to Plaça de Tetuan, where you could check out Gaudi’s forgotten sculpture, before turning left to pick up Passeig de Sant Joan. Ride up the passeig until you come to a fountain topped with a statue of Hercules and turn left onto Carrer de Còrsega, or continue to the very end of the passeig where you’ll hit the junction with Travessera de Gràcia and hang a left. Having arrived you may want to take a little time getting your bearings. Go HERE. So, what can I do now I’m here? Where can I get a snack? Where can I get dinner? GO HERE and check out these suggestions.